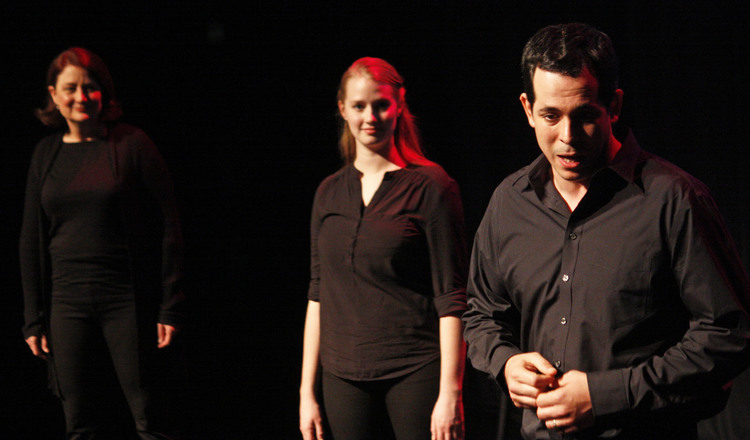 No two reactions are the same in PostSecret: The Show, on stage at the Panasonic Theatre from May 3-May 8, 2016. Provoking strong thoughts and feelings, the presentation draws on empathy and a greater understanding of the person sitting next to you. For ticket information call 416-872-1212 or visit www.mirvish.com. Everyone has experienced a moment they’d prefer to go to their grave with rather than reveal it to others and risk ridicule and embarrassment. Secret collector Frank Warren insists it doesn’t have to be that way. PostSecret, the first online social project to make the leap to bookshelves, has proven this by encouraging people around the globe to anonymously submit untold truths on a postcard to better understand the past and present. Ten years later, the 100% crowd-sourced theatrical event PostSecret: The Show is spreading the word in a venue near you. No set, no script, just a handful of performers detailing often funny, sometimes disturbing yet always intriguing real life obscurities. Frank Warren’s artistic initiative has seized hearts far and wide. As Toronto audiences discover what the hype is all about this month, the accidental hero from Maryland, USA, wholeheartedly discloses the psychology behind the exposition. YOUR AFFINITY WITH THE UNSPOKEN BLOOMED AT AN EARLY AGE LONG BEFORE IT TOOK SHAPE ON THE WEB. WHAT’S THE REASONING BEHIND THIS? I think reflecting back on my own childhood, I recognized family secrets we kept from others. Maybe secrets that were kept from me. That was a seed, a fascination for family secrets. I also believe that people have rich interior lives that they don’t always get a chance to share. I thought if I could create a safe, non-judgemental and trusted place to do so, it could be really special. I tried to honour that space and those stories in a way that people can continue to trust me. MORE THAN 750 MILLION PEOPLE HAVE VISITED THE POSTSECRET BLOG. IT’S EVOLVED INTO 6 BOOKS AND NOW A THEATRE PRESENTATION. IS IT TRUE THAT NONE OF THE MATERIAL IS MADE UP? The play started five years ago with a team of creatives. For weeks and months and years we tried to fit these pieces of the puzzle together to move people theatrically in a similar way that the website/books were able to do. The goal was to ensure audiences could feel a connection with a stranger who may be articulating their secret better than they could say it themselves. The theatre production takes the most poignant, heartbreaking, inspirational and romantic stories from these postcards. They are brought to life through dramatization. It’s all non-fiction; it all comes from the community. ‘YOU ARE NOT ALONE’ IS THE THEMATIC DRIVER OF ‘POSTSECRET: THE SHOW.’ WHY DID YOU CHOOSE THIS AS THE MESSAGE CENTRE POINT? There’s this paradox now, we’ve never had more tools of communication—digitally or otherwise—but at the same time there’s never been a greater sense of loneliness and isolation. I see that through the reflection in these secrets. With this project, I feel I’ve uncovered some things in individuals but also collectively. We put the good news on Facebook but I feel there are a lot of heavy secrets that never surface in open discussions. It’s these stories that make us feel stigma or isolation and we keep private. We don’t talk about it in the show but there is a shame that goes along with being alone and feeling like you don’t have a partner or the right community to fit into. Many of us feel this sense of loneliness that’s kept hidden. Sometimes when you keep a secret it’s exacerbated. It feels like a wall separating you from others and you have to invest this energy to create a defense to protect yourself. If people could just realize that we’re not alone with our secrets, everybody has them. And somebody has one just like you which serves as a bridge that connects you with others in a powerful way. Through projects like PostSecret: The Show, people recognize that even those big secrets they think no one would understand can be a gift—not a burden—if they have a safe way to let it out. YOU’VE SAID THAT THERE ARE TWO KINDS OF SECRETS—ONES WE KEEP FROM OTHERS AND ONES WE HIDE FROM OURSELVES. WHAT’S THE ONE SCENE IN THE PLAY THAT HITS CLOSEST TO HOME FOR YOU? I wasn’t prepared for what was going to happen next. That day a million people had visited the website. And I started getting other e-mails from other young people telling me their stories, sending me pictures of their broken bedroom doors. And then I saw one particular photo of a broken door that reminded me I, myself, had two similar broken doors when I was young. I was inspired to write that secret on a postcard and mail it to myself. I share that story at live speaking events. Every time I talk about it, I feel like I have a bit more ownership over that part of my past. MANY PEOPLE WHO HAVE EXPERIENCED THIS PRESENTATION HAVE DESCRIBED IT AS CATHARTIC. WOULD YOU AGREE WITH THAT? Absolutely. They have a chance to tell a true secret from their own life. Audience members have a chance to write down secrets on postcards and have them read back live by the actors. At one part in the play, we share all these voicemail messages that people have kept on their phones from someone who has died—a parent, a friend, a coworker. It’s like a conversation of final messages reminding us that one day we’ll be that final message on somebody’s phone too. I hope the best part of this experience is the drive home conversation you have with the person you came with—talking about something the show reminded you of your past. Secrets are the currency of intimacy. And if we can use them as gifts it allows us to deepen communication channels with friends and family. TorontoStage how do you keep getting these interviews before the show even opens? It’s like you’re everywhere at once getting the scoop on all the stagings. I can’t tell you how much I appreciate a preview like this story on PostSecret: The Show. You’re having the hardest working media team in the city. I just saw this Tweet and had to read the story. I know so many people with skeletons in their closet and it’s killed them over the years. Everything that Frank Warren spoke about including building walls is so true. I don’t know if PostSecret: The Show will help them ease the pressure but I’m definitely dragging one of them to the show to relieve the pressure. I sent 5 secrets to the website over the last few years, I hope they strengthened people going through the same things. I’d be in utter shock if they made it into PostSecret: The Show but I’m not that vane to think it would. Sharing secrets like this feels very refreshing. This really is a new platform to help us all get on with our troubled lives.